The effects of climate change are especially obvious in arid environments where resources are scarce and subject to seasonal availability. The effects of climate change are especially obvious in arid environments where resources are scarce and subject to seasonal availability. However, the demographic mechanisms through which seasonal climate affects population persistence remains mostly unknown. Using detailed monthly life-history data collected by the Kalahari Meerkat Project between 1997 and 2016, scientists at the Universities of Zurich and Cambridge have now assessed how meerkats (Suricata suricatta) will fare in response to future changes in seasonal rainfall and temperature. 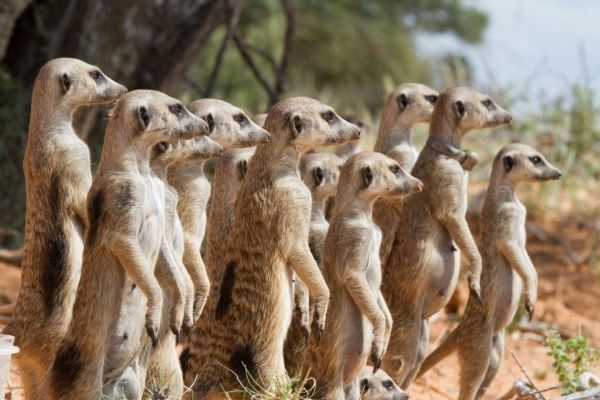 Meerkats are cooperative breeders that live in social groups. A dominant female monopolizes most of the reproduction, while subordinate helpers assist in raising her offspring. Changes in the physical and social environment affect the growth, survival and reproduction of meerkats. For example, wet and warm conditions at the beginning of summer increase the growth, survival and reproduction of these animals. In contrast, high population densities and cold weather during winter decrease individual growth and survival. The Kalahari Desert in Southern Africa is projected to become drier and warmer as a result of climate change. The new study investigates how consistently rising summer temperatures and rainfall fluctuations will affect body mass and growth of meerkats, resulting in lower rates of reproduction and offspring survival. However, this isn’t the only finding of the study.